Decorate your home or garden with our Personalized Cancer Awareness Garden Flag to help raise cancer awareness. 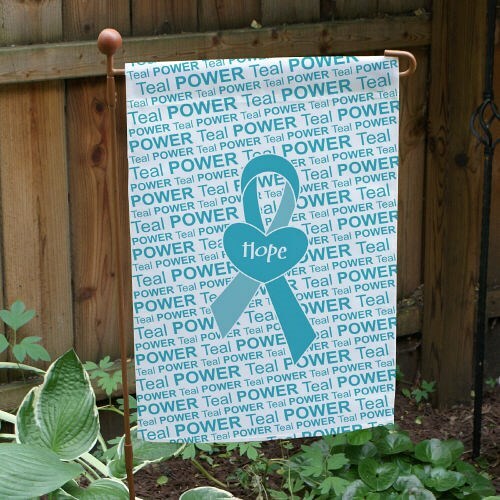 Our Custom Teal Ribbon Garden Flag is perfect to show your support in helping find a cure. This garden flag is an all-weather 100% poly garden flag. It measures 12 1/2” w x 18” h and is available with one-sided or double-sided printing. The one sided garden flag features the design printed on the front with the back being blank. The double-sided printing features the same design printed on both sides. Available for an additional fee. FREE Personalization is included. Personalize your Garden Flag with Any name. I've been looking for an Ovarian cancer flag for years!!! Finding this AND being able to personalize it meant the world to me and to my mother (I bought her one, too)!!! !